Why Isn’t Anything Being Done about the Evansville Cheating Scandal? Two weeks ago today (August 4th), I was informed from some players within the Frontier League that big news was about to drop and an official statement would be made public by the league the following day. However, an official statement was and has never made. The story that has been creating buzz around the league did come out publicly when the Evansville Courier-Press printed an article on August 6th. 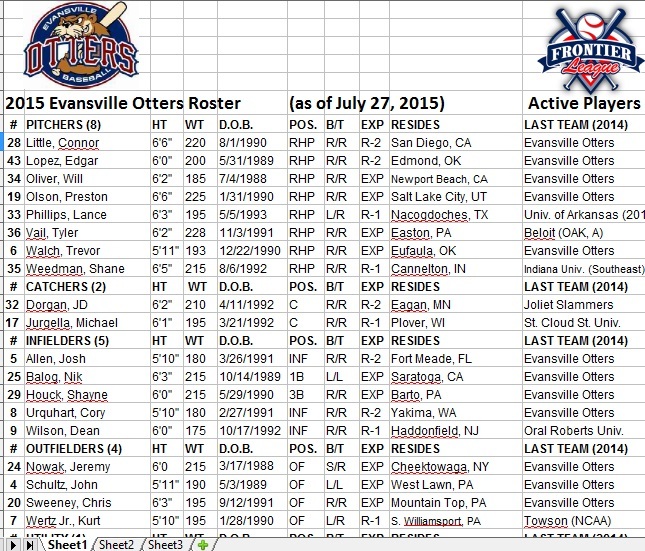 It was discovered that an experienced pitcher with the Evansville Otters, Will Oliver, had turned 28 on July 4th, which happens to be against Frontier League age limit rules. No player or player/coach may have attained twenty seven (27) years of age prior to January 1 of that playing season with the exception of one player who will be designated as a “Veteran” player who may have attained thirty (30) years of age prior to January 1 of that playing season provided that he meets the qualifications listed below. For the 2015 season, players must have been born on or after January 1, 1988 to be eligible, aside from the Veteran classification player (one per team) who must have been born on or after January 1, 1985. Oliver does not qualify for Veteran status because he was not on a Frontier League roster for 100 games over the last two years. He only played with Evansville towards the end of the 2014 season, not nearly enough to qualify him as a veteran of the league. What’s worse is that the team had presented three different birth years for Oliver. 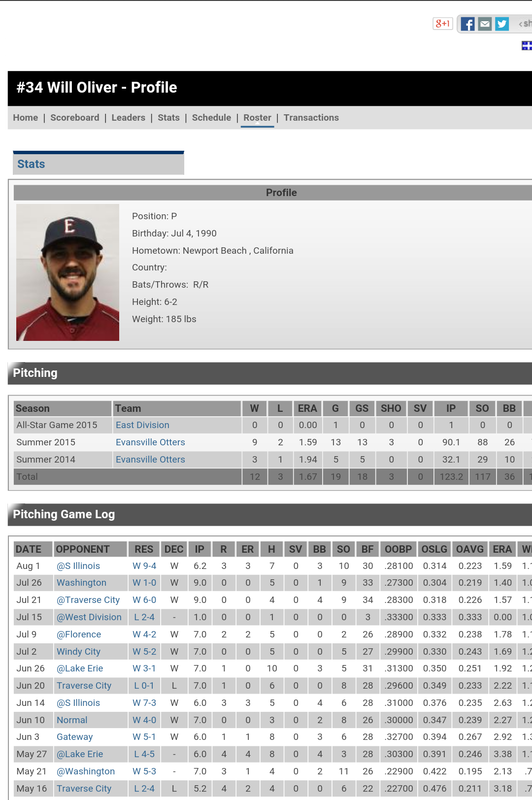 and July 4, 1990 on Pointstreak – the official stats website for the Frontier League. 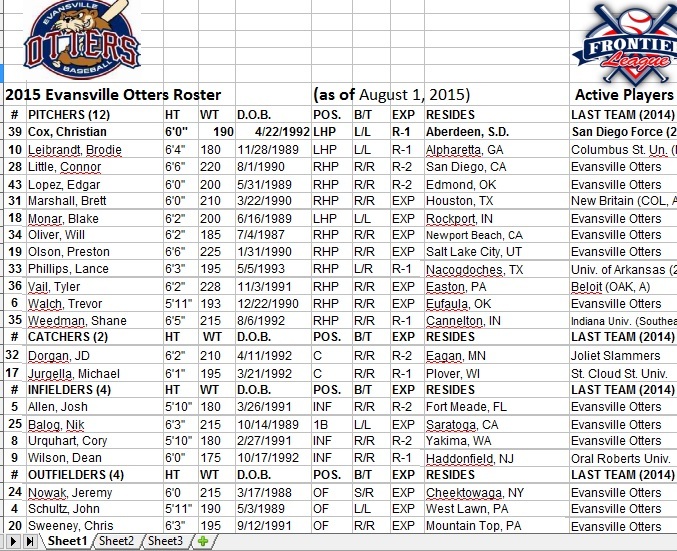 Oliver pitched in 13 games with the Otters with a 9-2 record and 1.59 ERA. Ultimately, the Otters ended up winning 10 games in which Oliver pitched, and the team is currently tied for first place with the Southern Illinois Miners. I was in Evansville — and I found out from two other teams before my manager, which was irritating, but it wasn’t intentional because gossip got out fast — that I ended up aging out of the league due to a contract technicality,” said Oliver, who was set to make his team debut during Monday night’s game against the Sugar Land Skeeters. The league commissioner approved my contract in April, so it’s their fault for missing it. Our manager sent me the contract in the off-season and asked if I wanted to play again, and I said of course. I loved it in Evansville, so it was a no-brainer. But I found out a few days ago that I aged out, and they’re nullifying my contract and I couldn’t play anymore. They wanted to take away my wins I had. I don’t think that’s going to happen, because that’s just not right. From my research, this is the first time in the 23 year history of the Frontier League that anything such as this has occurred. Something needs to be done to set a standard and show that cheating and fudging birth dates to get around league rules will not be tolerated. Since the story started spreading throughout the league, there have been many rumors on what is going to happen to the Otters. The first rumor was that the team has to forfeit the 10 games in which they won that Oliver had pitched. The next was that the team would be fined, but their record would be left as is. The last one that I heard was that they would be forced to forfeit the games in which Oliver played in, but the teams that lost would not end up being credited with the win. I’ve also heard many rumors among players that they believe the Frontier League will do nothing because the commissioner, Bill Lee, is very close to the Evansville Front Office and doesn’t want to cause any problems for them. The league has called in lawyers to investigate, but it appears as if they do not want to actually bring about a penalty to the team. The Washington Wild Things Blog is the only other website I could find that even brought up this story. It seems as if the Frontier League is hoping that they can sweep this under the rug, and no one would notice the difference. With less than a month to go and the Otters tied for first place, the league needs to do something soon. If they’re worried about ruining the perception of the league by penalizing the Otters, it’s too late. By not doing anything for over two weeks, they’re already ruining their reputation.